high quality extra virgin olive oil obtained from the selection of the best olives from organic farming, grown in a P.D.O. (Protected Denomination of Origin) area. The olives used are ideal to produce a P.D.O. Valli Trapanesi extra virgin olive oil, one of the most prestigious Sicilian P.D.O.s. The result is a product with a very strong personality, with the typical fragance that recalls the fresh fruit and with a pleasant almond aftertaste. Lorenzo #1 is a slightly dense oil, brilliant green in colour with golden yellow reflections, spicy with a persistent herbaceous and intensely fruity flavor. Well-rounded taste with green tomato and almond finish - use to perfect great disches and to enhance the flavor of any Sicilian inspired meal. from the best organic fruits of Central Sicily, this precious extra virgin olive oil has a mild fruity flavor and a well rounded taste with light peppery finish. A slightly dense oil, golden yellow in color, with a mild almond aroma. 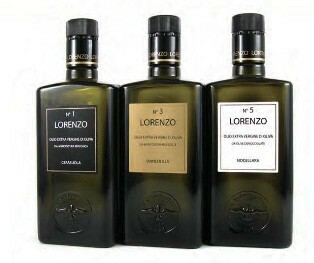 Lorenzo #3 is excellent on salads and seafood dishes. a simply unique oil using a single olive variety (100% Nocellara del Belice), where the stone (pit) of the olive is extracted first, eliminating the bitter component of the olive, thereby creating an dense, bright golden oil of noted creaminess with a delicately spiced aroma. Use Lorenzo #5 in place of cream or to amplify the flavors of any great dish. Harvest: harvested by hand during the second week of October.